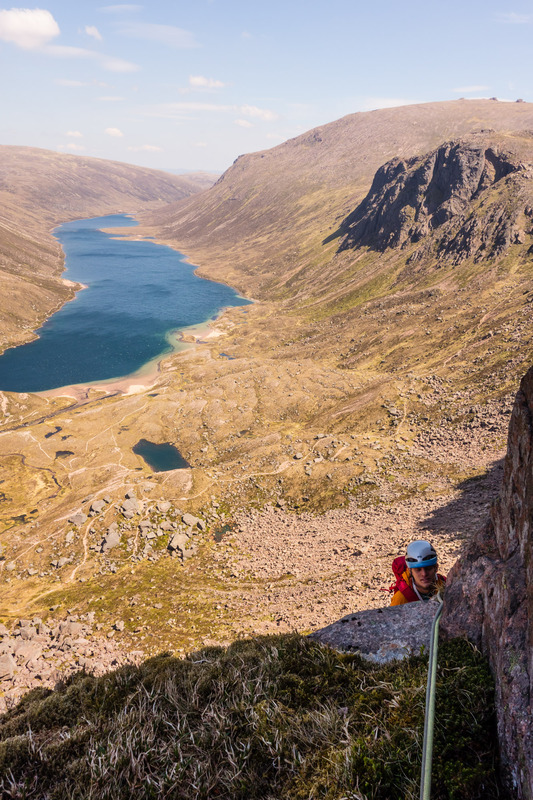 Following a long period of dry weather the hottest day of the year was forecast, warranting a day off from work to capitalise on the excellent mountain rock conditions. 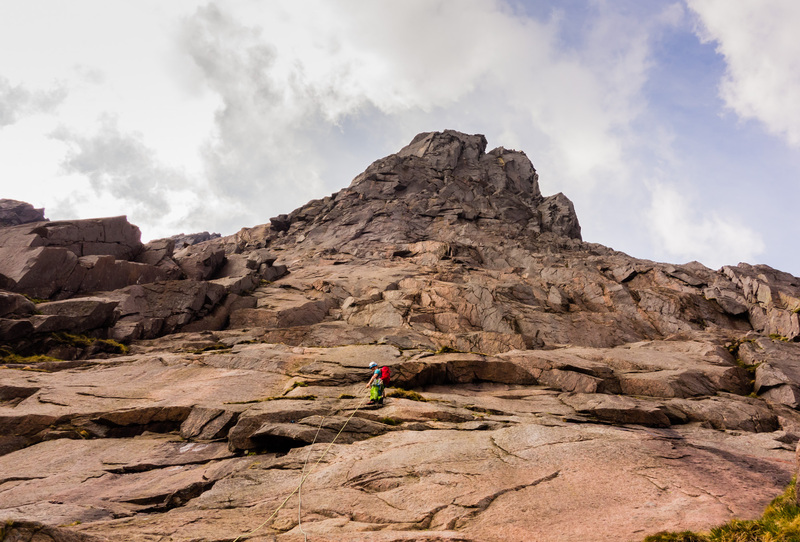 With recent ascents on the high north facing Shelterstone Crag confirming dry rock, Andy and I headed in to the heart of the Cairngorms in far moodier weather than expected. 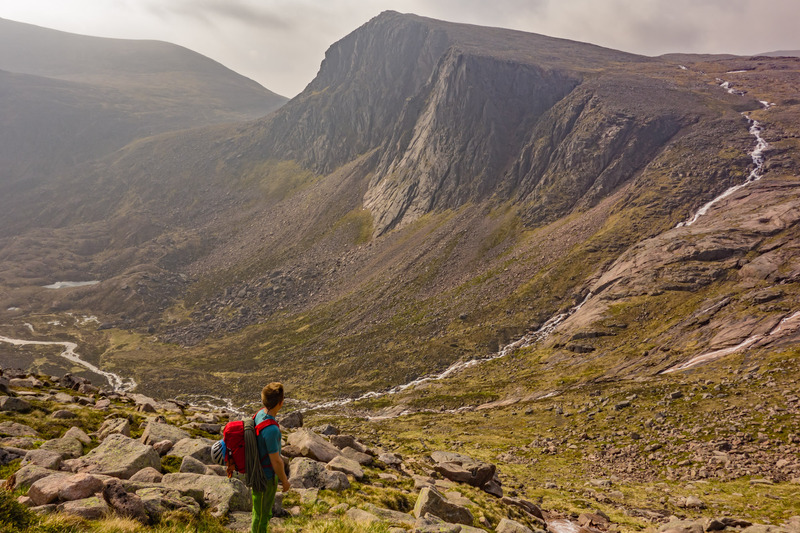 The Shelterstone Crag and Carn Etchachan seen on the descent from the plateau down Coire Domhain. Where are the bluebird skies? 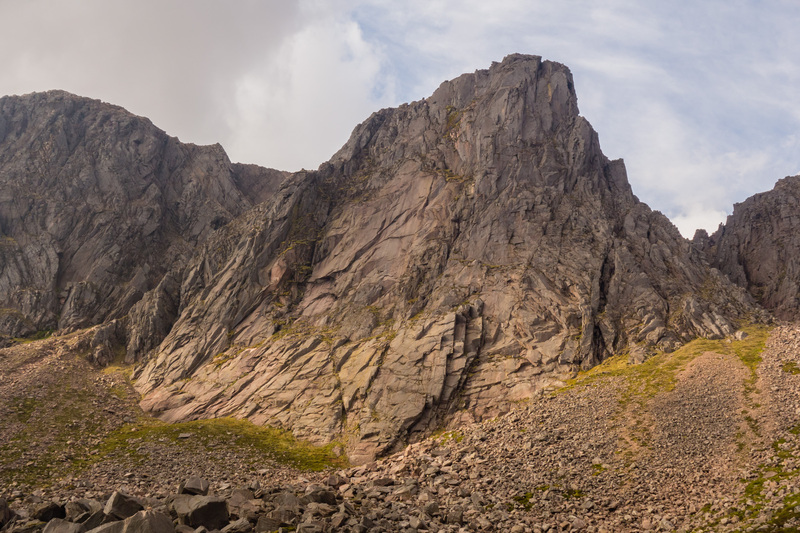 The Needle (E1, 5b) is considered one of the best routes of it’s grade in Scotland, taking in many different styles of climbing up its ~260m length and firing straight up one of the most impressive cliffs in the UK. It had been on our hit list for ages but we knew it would test us. 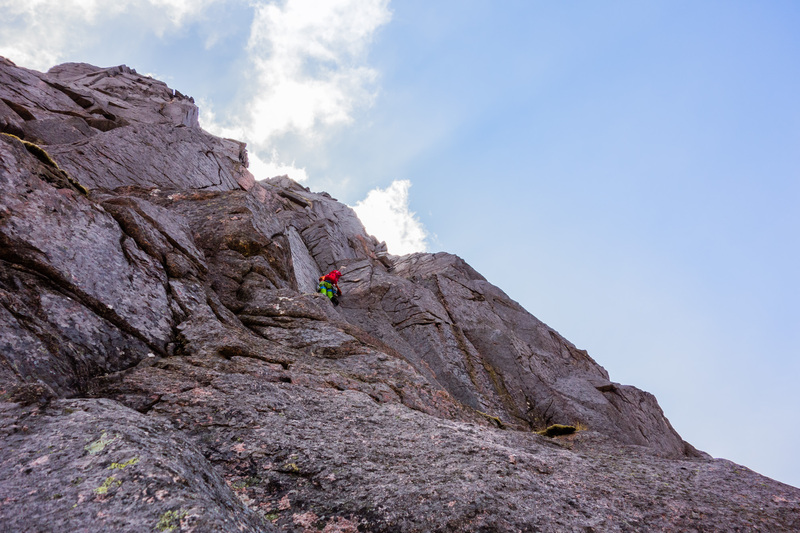 The individual pitch grades appear to alternate between “easier” and “harder” but in reality this felt like a very sustained route with some bold and interesting climbing even on the easier pitches. We decided to lead in blocks of two so we would each get some E1 pitches on the sharp end and Andy kicked us off with a brace of excellent leads on the bold lower section. 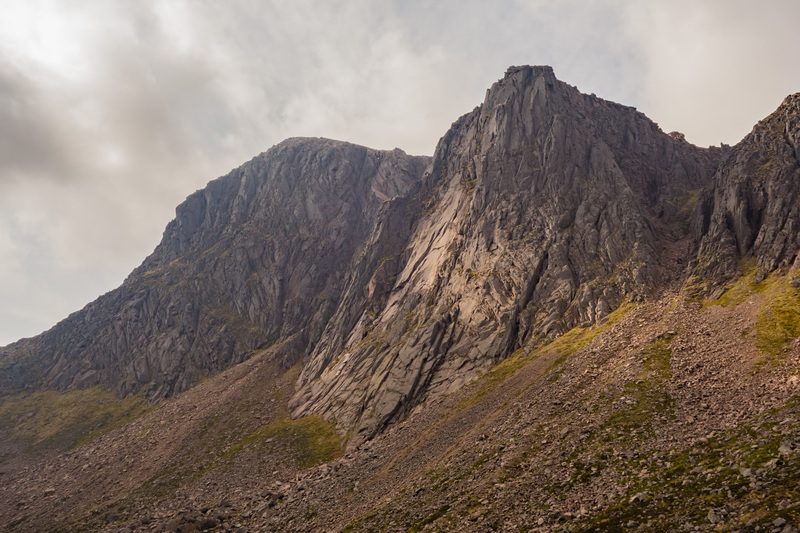 Andy flying up the first pitch as the ever-steepening crag looms ominously above – a long way to go! Many consider the second pitch the crux but apart from a couple of tricky 5b bulges the real difficulty here is psychological – run-out 4c/5a climbing requiring technique and balance. Andy did a fantastic job and deposited us at the base of a steeper section of crag. After a scary route-finding error I led us to the bottom of the second 5b pitch and looked up intimidated by the terrain above. Clocking where the climbing looked hard higher up the pitch, I launched off the belay ledge into a steep groove and got gripped immediately! The groove was awkward, technical and only just adequately protected and in hindsight was probably the trickiest part of the pitch. A stunning flake line and an exposed traverse led to a final steepening, overcome with strenuous lay-backing and finally to a luxury belay ledge. Great views from the comfy belay at the end of the spectacular fourth pitch. Andy looking thrilled. Andy linked pitch 5 and 6 resulting in him scampering up the famous “crack for thin fingers” high above the belay. The crack is difficult but thankfully very short and posed no issues for an on-form Andy – removing gear on second was a tad tricky however! On the next ledge we were perfectly positioned to watch the leader of an adjacent team cruise the defining pitch of Steeple (E2, 5c). 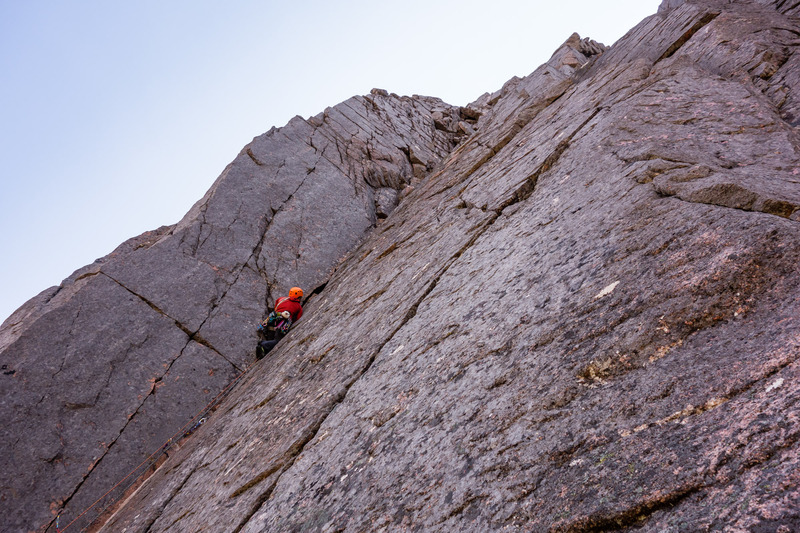 The massive corner dominates the headwall of the Shelterstone and must be one of the best positioned pitches around! A leader enjoying the climbing on the stunning corner pitch of Steeple, inspirational stuff! A quick but surprisingly strenuous pitch led us to the infamous Needle crack. 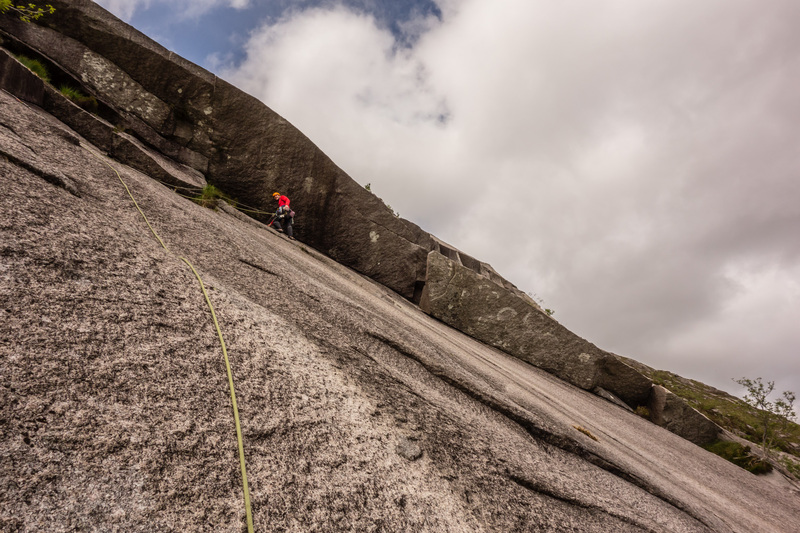 Andy valiantly agreed to take the reigns for which I was immediately thankful, as this pitch, despite it’s modest 5a grade, is by far the crux! This section would be hard enough if bone dry, but incredibly the crucial layback crack was running with water. 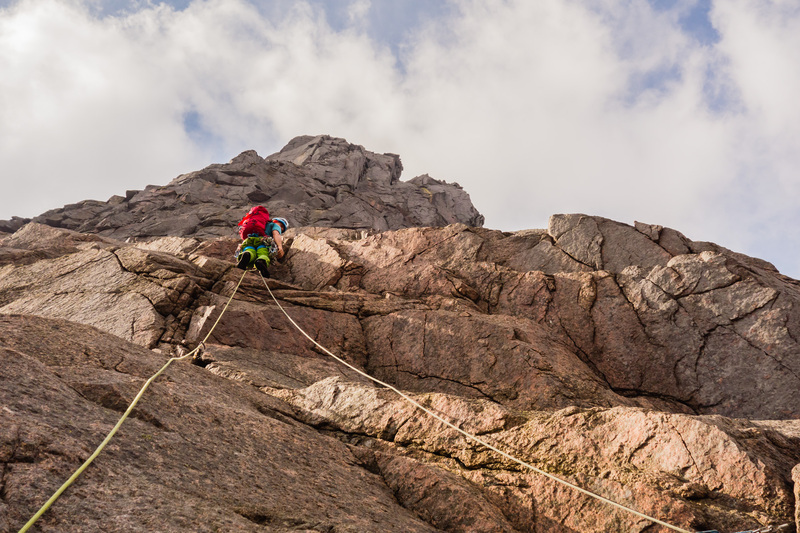 What followed was one of the most impressive leads I’ve seen and seconding the pitch I was in a state of perpetual shock as the difficulty of the climbing combined with the immense exposure led to total sensory overload. Swapping the final wet squeeze chimney for a loose wall saw us sun-bathing on the plateau, extremely content and slightly spaced out after such an adventure. 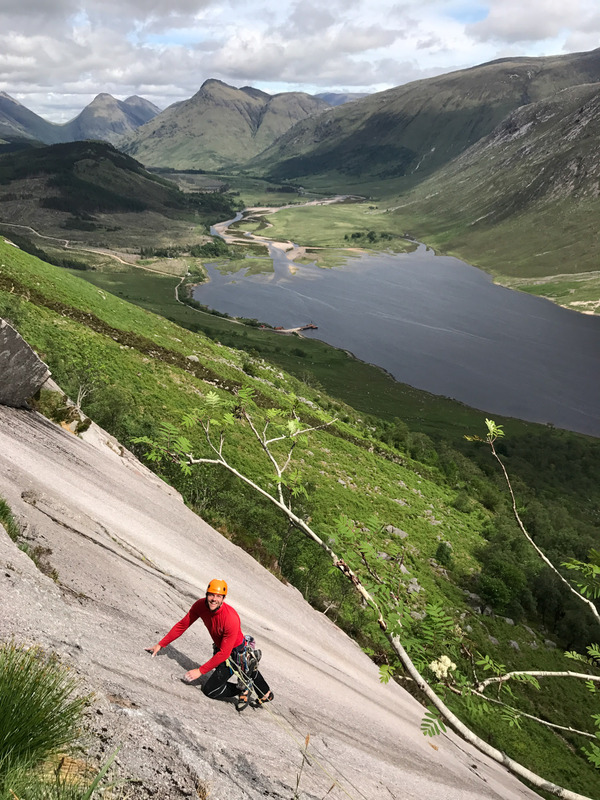 The next day Ric and I headed for Creag Dubh while Andy and Joe raided Sneachda for a quick hit on Magic Crack (HVS, 5a). 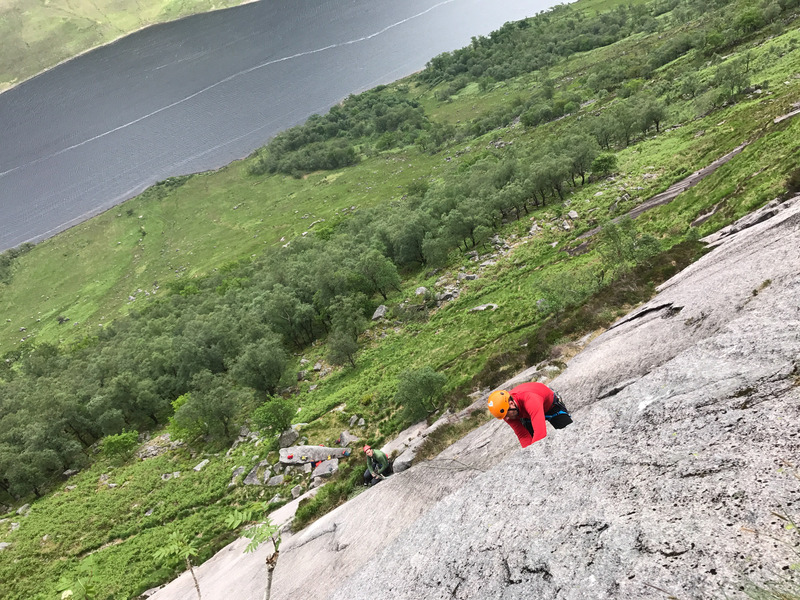 We sweltered our way up Brute (VS, 5a), the fantastic and underrated Giggling Slab (VS/HVS, 4c) and while I racked up some air miles on Man on Fire (E1, 5b) Andy and Joe turned up and ticked King Bee (Vs, 5a) and Inbred (HVS, 5a) to round off a stonking 10* day! 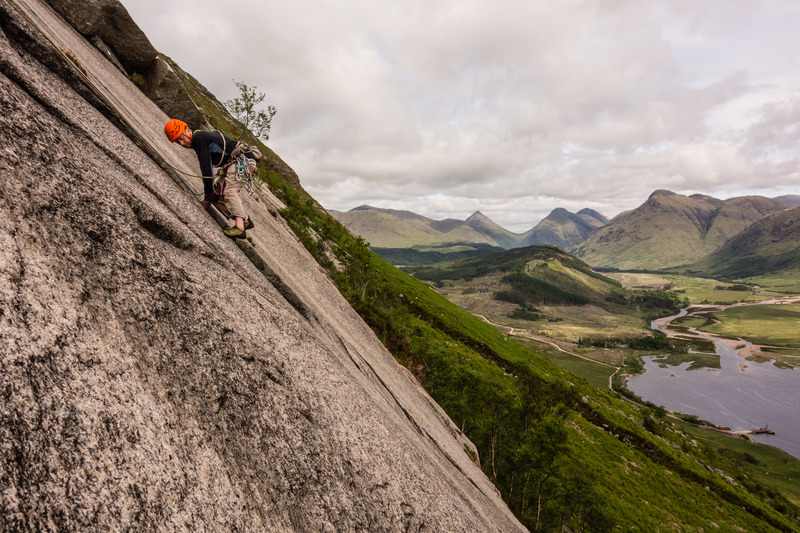 Undeterred by that night’s rain we staggered up to the Etive Slabs on Sunday for unfinished business. Another team set off up The Long Reach (E2, 5b) as we geared up and then while Andy and Joe made short work of The Hammer (HVS, 5a) and Raspberry Ripple (E1, 5a), Ric and I had a minor epic on The Pause (E1, 5b). Lingering dampness and black slime forced a harrowing heathery detour around the first pitch and a variation to the second. At this point my head exploded and Ric quested on up the incredible third pitch. The pitch is very well protected but with wet streaks beneath the overlaps Ric had to traverse some way below them, exercising total faith in friction. The final exciting down-climb on smears into the crevasse belay was very memorable. Pitch 4 is notoriously bold and contains difficult route finding. Ric made it halfway up the pitch but after being cast adrift in a sea of blankness for well over an hour, psyche began to ebb. Eventually we bailed and feeling fairly spanked we sloped back down to the cars and the long drive home. We’ll be back!